Cheongidan Radiant Rejuvenating Balancer 150ml + 25ml: CheongidanRadiant Rejuvenating Balancer is a skin lotion for skin de-aging by lightening entire skin from the deep. It revitalizes and lightens skin with contents including ginseng and powdered jade mixture, powdered deer antlers and powdered gold and tree extract. Cheongidan Radiant Rejuvenating Eye Cream 25ml + 5ml: Rich and ointment-like texture in white gold platinum. Moist and smooth application. Rejuvenates and firms the eye area. Elegant fragrance of Magnolia. Increases the blood circulation around the eye areas. 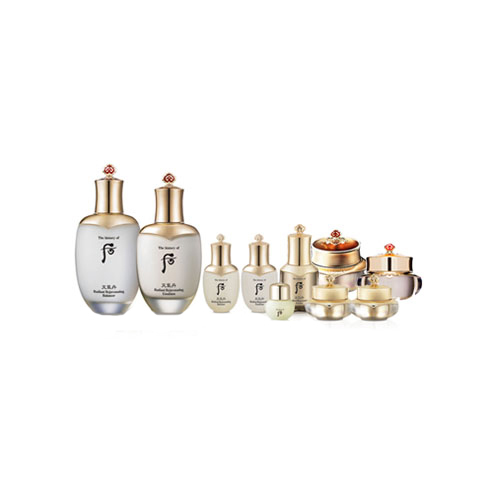 Cheongidan Radiant Rejuvenating Cream 60ml + 10ml: Rich cream that fills both in and out of the skin. Contains moisturizing ingredients that can hold 440% of the moisture in skin. Elegant floral fragrance of Magnolia. Total effects of moisturizing, resilience and regeneration. Cheongidan Radiant Rejuvenating Wild Gingseng Ampoule Oil 5ml: The oil extracted from wild ginseng, which adds virility, and germinated oil with strong vitality. Will maintain the dry and rough skin to be more elasticity and moisturized. (Contains 54.42% of wild ginseng extracts). After cleansing, take an appropriate amount on both palms and lightly apply on the skin, and gently tap for better absorption. Gently apply on the skin after the essence. After the balancer, apply on the skin and then gently press the whole face with both palms for better absorption. After the eye cream, take an appropriate amount and apply evenly on the skin. Rub both hands together to generate heat and gently press the whole face with warm hands for better absorption. After the balancer, take an appropriate amount and apply evenly on the skin. Rub both hands together to generate heat and gently press the whole face with the warm hands for better absorption.